We live in a fast-paced, internet-based world where everyone is busy and inpatient. People looking for a vacation rental or a longer term housing rental are online, doing searches and evaluating their options. When they find a suitable rental property that interests them, they want to know instantly if that property is available when they need it, and they want to be able to put in their reservation right there on the spot. Many times they don’t want to call and talk to a booking agent. An online booking calendar gives the property manager and vacation home owner the ability to put each and every property they manage into a real-time calendar-based booking system that prospects can access online. By offering an easy booking process that gives your prospect the flexibility to make their own online reservation without having to call a customer service or booking agent, you’ve won them over with the ease by which they can do business with you, let alone the payroll you save by not having to staff the telephone 24/7. Online booking calendars eliminate double bookings and provide a source of record for your reservations, thereby taking human error out of the equation. The online software is flexible, allowing you to customize virtually every option from how long the minimum booking is, to setting different rates based on seasons. 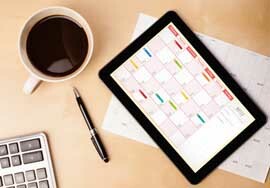 Online booking calendars allow the property manager to access the system from anywhere that has an internet connection. You can run custom reports that will let you know exactly the status of your bookings. Most systems have the ability to notify you by email when a booking is made online, so you’re always on top of your rental transactions. The better online booking calendar systems allow you to set up customers in segmented contact lists so you can market additional services to them at a later date. You can calculate all the fees including any applicable taxes, collect fees that are in addition to your rental fees such as damage deposits and cleaning fees, as well as offer custom additional discounts and specials. An online booking calendar built into your website is the perfect way to offer real-time scheduling options to your customers. Even small rental businesses will see the value in this relatively inexpensive software investment.